Ozone is a universal disinfectant that can oxidize many inorganic and organic impurities, and destroy bacteria, viruses, and other pathogens. Although it has been used for almost a century, it has only recently gained the attention of the food and agricultural industries. Ozone (O3) is a naturally occurring gas created during lightning storms or by ultraviolet light. It can also be manufactured from dry air or oxygen by passing these gases through an electric field. Its oxidation potential is greater than that of hypochlorite acid or chlorine, both widely used in water treatment. 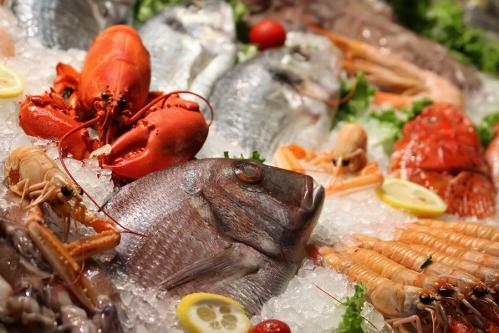 Since ozone is a strong oxidizing agent that can effectively clean soil and biofilm from surfaces, it works well in seafood-processing plants. With a half-life measured in minutes, ozone must be generated as used, and application results in the formation of few disinfection by-products. In most European countries, shellfish are processed in ozonated water. Ozone provides better bacterial and viral elimination than chlorine, without leaving a taste in the shellfish meat. In the U.S., several northwestern oyster farms use ozonated water to clean the oysters of any pollutants and silt they may have absorbed in their natural environment before going to market. Freshly collected oysters are shucked and put in tanks through which several changes of ozonated water are run to cleanse the animals. The residual ozone in the water completely prevents the growth of bacteria and organisms in the water-packed jars. The water is left clean and transparent during shipment and storage at restaurants and stores. The application of ozonated water to the preservation of fresh fish is not new. In the 1930s, Frenchmen LeGall and Salmon showed the shelf life of Mediterranean fish could be extended at least 33% by storage under ice made from ozonated water. The ozone sterilized the water, so that when the ice melted, the liquid water did not contain bacteria. In this manner, bacterial growth on fish surfaces was kept minimal. In a recent study, trout and salmon fillets were inoculated with Listeria monocytogenes, a bacteria often found in soil and water that can cause serious illness. After treatments using different exposure times and concentrations of ozonated water were analyzed, preliminary results showed that ozone was effective for surface decontamination. Bill Nelson pioneered the use of ozonated ice on fish in the early ’80s and proved a significant extension of shelf life. The work of Nelson and Neve’ with Alaskan salmon washed with ozonated freshwater and stored under ozonated ice extended the shelf life of fresh salmon from six to 11 days. Another potential use of ozone is in the prevention of off-flavor in seafood. For example, off-flavor in channel catfish has been a problem for this industry in the southern U.S. for many years, making many catfish unmarketable. Off-flavor is mainly caused by two chemicals: 2- methylisoborneol and geosmin. Treatment with ozone may solve this problem. As a processing-equipment sanitizer, ozone controls pathogens on the surface of food-processing equipment and machinery, and prevents their spreading into the food product. Ozone can also be used for sanitizing walls, floors, and other areas in processing plants. In addition, ozone is a very safe product, which in over 100 years of use has never been involved in a fatal accident. Compared to chlorine, which forms many toxic byproducts, ozone forms none. It is generated electrically and adds no chemicals into the treated water. As a wash for seafood, ozone removes bacteria and protein slime 10 times more effectively than chlorine. When handled correctly, higher concentrations of ozone can be used without toxicity or tainting the seafood. The U.S. Environmental Protection Agency (EPA) has granted approval for the use of ozone in the treatment of municipal drinking water. USFDA has added ozone to its list of bottled water disinfectants that are “generally recognized as safe.” After an extensive international survey of regulations and practices in 1997, a panel of experts from the Electric Power Research Institute published a declaration that ozone in food processing is a safe product. Until that time, the FDA had treated ozone as a food additive. Now the ability to use ozone extends to nearly all areas of food processing. Ozone can have many applications in the seafood-processing industries. It can be used as a fumigant, or the gas can be dissolved in water and applied as an aqueous solution. Ozonated water can be used to rinse equipment and facilities, and to control pathogens and spoilage microorganisms in processing facilities or on the food materials themselves. Its varied benefits will likely lead to further use of ozone by seafood processors in the near future. What happens if we stop treating our wastewater?